Combine the dry ingredients in a large mixing bowl - the flour, oats, LSC, cinnamon, ginger, baking powder and salt. Add walnuts and blueberries and mix in gently. In a smaller bowl, mix up the smooshed banana and almond milk and further smoosh. Add the coconut oil/butter after melting it down if needed (weather dependent! ), followed by the sweetener. Add the wet contents of the smaller bowl to a well in the centre of the larger bowl and gently fold in with a wooden spoon. Grease a 12-muffin muffin tray with coconut oil and top up to just about the top with muffin mix. I then did something sneaky-delicious - added a blob of jam to the top! 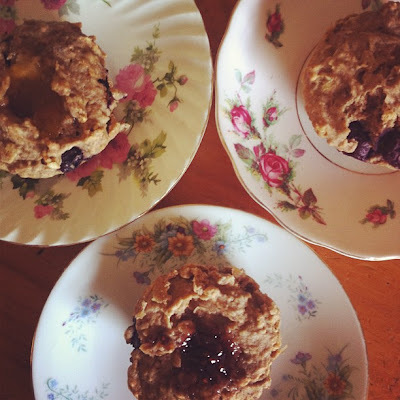 I used St. Dalfour's sugar free jams - apricot and raspberry, and they certainly contributed a little extra something-something to the muffins! Next, you bake your muffins for approximately 25-30 minutes, dependent on reliability of your oven. The old poke with a utensil of your choice should sort you out on how ready they are. Like the majority of my recipes, this muffin go-to is easily adaptable to a session of mix and matching. Experiment with the contents of your pantry and fridge/freezer for seasonal combinations and do let me know of anything extremely delicious you may come up with!